Brrr. On cold winter days like these, there’s nothing better than staying warm under my double duvet (<– you read that right, TWO duvets) covers pulled right up to my ears. Everything is so toasty right from my toes to my nose. But we can’t all stay in bed all day, right? So, staying warm from the inside out is the next best thing and having a hearty, healthy beef stew to savour is just what is needed for those chilly days. I love this stew. It requires a bit of work in browning the beef (trust me, it’s so worth it!) but the flavours and the textures make me salivate just thinking about it. It’s a hearty blend of winter vegetables (you can use whatever you might have on hand) and tender beef that cooks itself while you’re off back under the duvet covers. In a large resealable plastic bag or a large prep bowl, combine flour, salt, and pepper for the dredging mixture. Add beef (make sure to pat the pieces dry before dredging) a few pieces at a time and toss to coat. In a Dutch oven (I use a 7-qt for this recipe — tons of leftovers for lunch the next day!) over medium-high heat, add grape seed oil and brown beef in batches (about 1 minute per side). Remove and set aside. Don’t clean the pot after this step — those delicious little beefs bits stuck to the bottom are what’s called fond. There is wonderful flavour there waiting to be released into the stew! Add onion to the pot and cook until tender. Add garlic and cook for 1 minute longer. Add 1 cup of beef broth (or the red wine, if you’re using it) and stir everything about, fond and all. Add the beef, tomatoes, potatoes, carrots, parsnips, thyme, and Worcestershire sauce, as well as the remaining beef broth. Cover with lid and cook in oven for 2-1/2 hours or until meat and vegetables are tender. Season with salt and pepper as needed before serving. 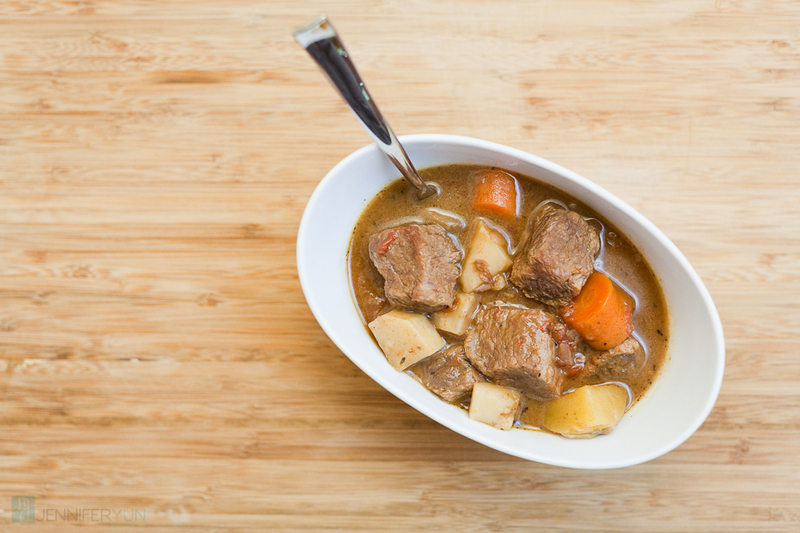 Recipe keynotes: A warm and hearty stew, perfect for those chilly winter nights.